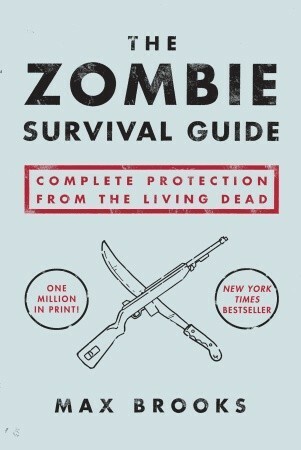 The Zombie Survival Guide: Complete Protection From The Living Dead by Max Brooks. I recently completed this book on my growing fascination with the Zombie genre and the tangents to real possibilities. As I browse around the internet or catch a documentary this book always came up at some point so I thought I would break down and get it. My review is going to be on the content and the approach I took when I started to read it. Most will think this is a tongue-in-cheek book but the author's thought, research, and details that is in here go beyond how this book is sold and perceived. First this book can be found in the Humor section of Barnes and Noble which I guess the right place for it to be only because no one would take it seriously if it was in the outdoors section with other survival guides. 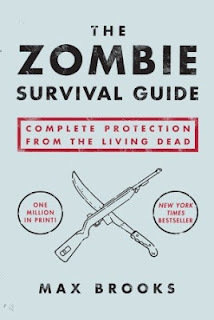 As you read this book, if you take away the Zombies, this book is filled with useable, strategic, survival techniques that can be applicable in many non-Zombie situations. How to fortify your house, survive on the food you have, what types of weapons are best for certain scenarios and other potential life savings tips. Now the underlying tone, especially the last 1/3 of the book, is about a zombie outbreak of various levels. According to the book the zombie outbreak is caused by a very complex virus. Now for being abook of fiction, or so we are led to think, the details about the virus are extremely convincing along with the rest of the details of the levels of outbreak. If you are a fan of the show The Walking Dead and read this book you can't deny that this book was the guide for the comics the show was based off. Even though you may think this is a gag book or a joke book because its about zombies think again. There is enough realism that is at the core of this book that I think it's actually useful in certain situations even if the zombie apocolypse never happens.